Tim Wagner Bike to Work Day. Whether you've lived in the Bay Area for three days or three decades, you probably know the spiel backwards and forwards: Bicycling is, in many senses, the ideal way to commute. In an urban area, it's often cheaper, more environmentally friendly, healthier, and faster than driving or taking public transportation. It helps bring customers to the doorsteps of local businesses, and some suggest that it's good for public safety insofar as it makes for more eyes on the street. And the East Bay, with its relatively flat terrain, bevy of bike lanes, and pleasant weather, is just about the perfect place to do it. Renee Rivera knows you know — she's a Bay Area native, too, after all, and grew up riding her bike to Berkeley High every day. In her capacity as executive director of the East Bay Bicycle Coalition, she has watched East Bay bike culture grow by leaps and bounds in recent years. And at the same time, she's seen infrastructure become more hospitable to biking, with developments like increased bike parking, better signage, and more bike lanes. It's not just Oakland and Berkeley, either, she said: People in East Bay cities like Richmond and Fremont are increasingly commuting by bike. But despite all this, Riviera also knows that there are plenty of reasons people are wary of two-wheeled transportation: "There's still a lot of nervousness out there," she said. "People are worried about convenience, there's a perception that it's not safe." Depending on where you work and live, you might be concerned about time or terrain, and some workplaces still don't offer much in the way of bike parking. 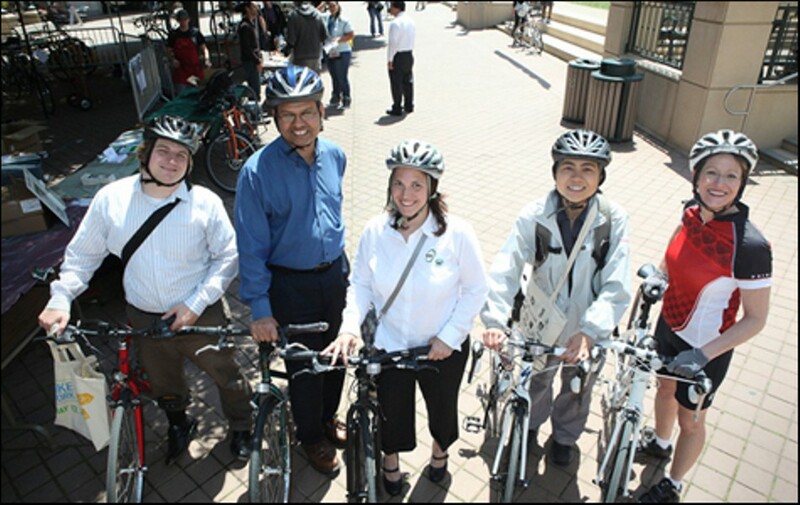 That's where Bike to Work Day, on Thursday, May 10, comes into play. Now in its nineteenth year in the East Bay, the event is aimed at casual riders: that is, folks who are comfortable on two wheels and who might ride to the grocery store or around Lake Merritt a couple times a week, but who, for whatever reason, have yet to take the plunge into commuting by bike. Participation in the event has more than doubled in the last four years, according to Rivera. What's more, studies show that people who participate in Bike to Work Day even once are thereafter far more likely to look at riding as a viable way to get to work. "What we hear over and over again is that people find biking much quicker and easier than they thought," she said. 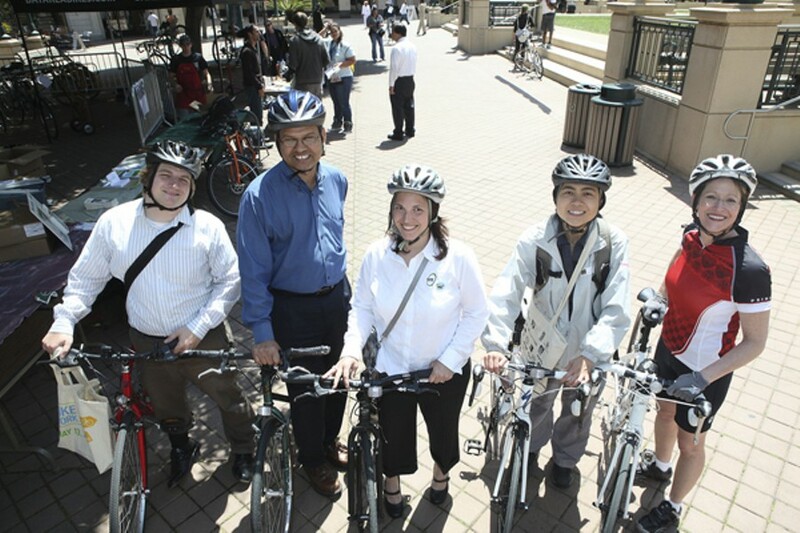 In other words, Bike to Work Day is really about demystifying, celebrating, and promoting bicycling as a lifestyle, which goes a long way to explain why it's also the coalition's highest-profile annual event. And this year will be no different: More than one hundred "energizer stations" will be set up across Alameda and Contra Costa counties to provide food, encouragement, and donated goodie bags to bicyclists. Various partner organizations will also host related events throughout the East Bay, and Old Oakland businesses will host an after-work street fair and happy hour, complete with a dance party. Rivera, for her part, will be biking as usual — only this time, she'll have a lot more company. All day, free. See EBBC.org/btwd for a full schedule of events and an interactive map of energizer stations.